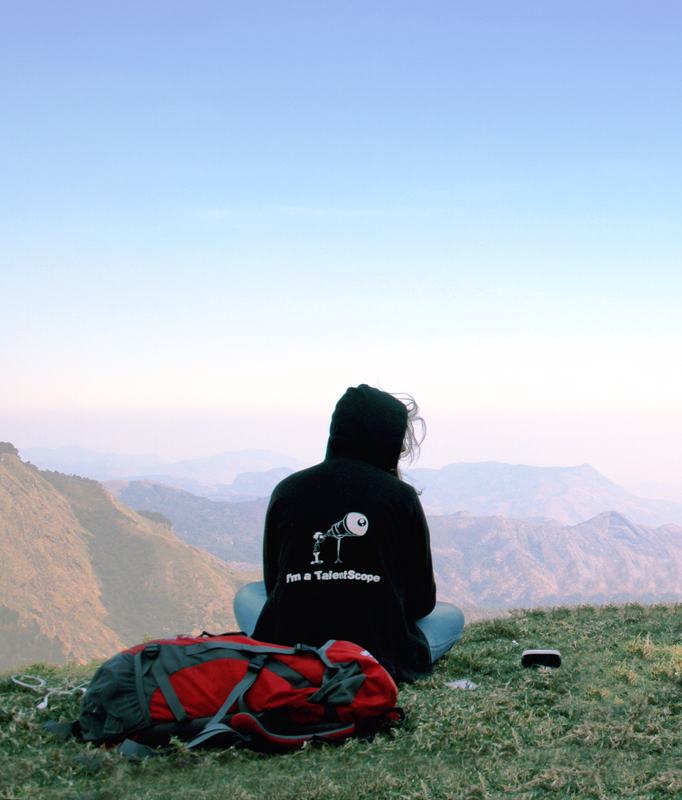 Recently I was on a hiking trip to Kodaikanal with my buddies and I experienced few life changing moments which made me to write about it. I was a couch potato until I got the golden ticket for the hiking trip which was already planned by my friends . The ticket was first actually offered to another person and finally it turned out to be me who was the extra seat filler. We were 6 of them including me. These guys picked me up near my room and we all bucked up and finally set to kodaikanal. Next day morning we started our hiking. We walked and walked and walked and walked. I started feeling my knees shivering. I started breaking down. After a long walk we reached the top of a mountain. Its was a charming landscape. Blue mountains stacked up in rows, streaks of orange light gleaming through the clouds. This made me speechless. I walked deeper towards the corner of the mountain and realized I was entirely surrounded by foreigners. People from different countries gathered on the mountain top. They gather around with african drums, guitars and singing. They are being what really they are. I hardly saw Indian hikers and trekkers around there. While darting my eyes through the groups, an individual stole my attention. The lady in the black hoodie. “I’m a Talentscope” printed behind her hoodie. I went and sat behind her and that’s where I mugged this photograph. She was sitting all alone enjoying her fruit salad, highly energetic song from the black tiny box near her (you can see this on the picture near her), reading ‘The Alchemist’ and puffing her smoke. She was looking at the sky in front of her dreaming, listening to the music and relaxing. “What kind of life you were living..?? Being a couch potato and feeling so proud of it, what worthy of life u possess till now…?? Look around you moron !! What do you see..? ?” I started hearing questions deep inside me. I felt shame of myself. I was looking at that lady without batting my eyes. Man prays to God for a tiny place in heaven everyday but why they are keeping their eyes shut to enjoy the heaven God has already given. The mountain, sea, valley, rivers, plains, hills. Go out there. They are plenty of places God created for man. Go out there. See really who you are. I took the bag and started walking. I chose not to look her face. Let her be The Lady in the Black Hoodie who taught me the most important lesson in my life. “Lets keep it simple and clear.It’s for all of us. This secret should never leak outside, NEVER EVER !! “Others pretend as if you were playing cricket. Joy Joseph went inside the staff room. Few minutes later he came outside with a notebook in this hand. “Is that the one..? ?” Jeejo asked in sign language. Joy rushed inside the gents toilet took a paper and pen started copying all the questions. We were guarding him outside as if we were playing cricket. After few minutes Joy came outside with a piece of paper and a notebook ran to the staff room and came back. “It stinks badly inside” Joy yelled at us. “What are the questions..? ?” sign languages everywhere. “Not here, lets gather in Hari’s house” replied Joy. Everyone left the school gathered at Hari’s house. Hari narrated the questions and others were all writing it down. Everyone left. I started studying with the question paper hidden inside my book. “What happened..?? I always have to yell 17,000 times but now you started studying without saying..? ?” Mom asked me. Mom looked at me and left the room. After realizing I will score 60 marks, I took the duplicate copy and started burning it. I lifted my head and saw mom standing in front of me.